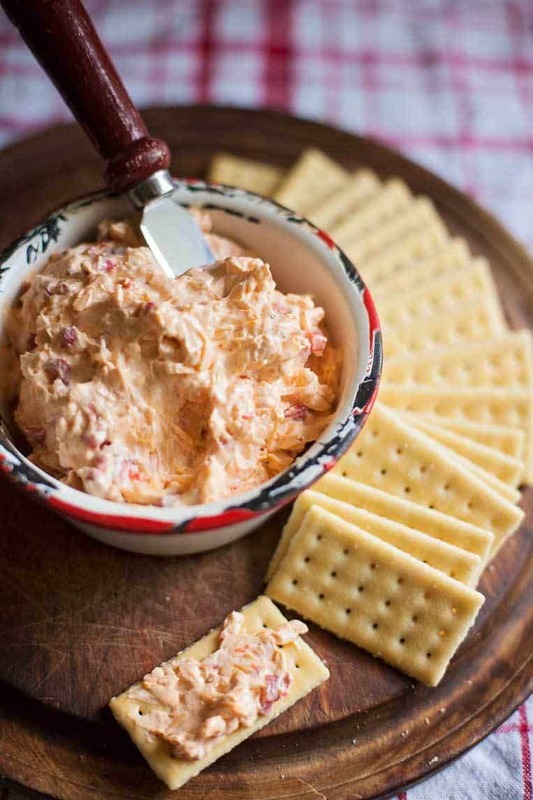 Homemade pimento cheese doesn’t have to come from a plastic container at the grocery store. Demystify this southern classic and make a perfectly creamy version you’ll be proud to serve and even happier to eat. Every good southerner knows that pimento cheese is a staple on a slice of white bread. It appears at every baby shower, wedding and graduation event year round and proudly stands next to the peanut butter and syrup sandwiches–ready to be devoured. Yes peanut butter and syrup sandwiches are a thing too. But most of us rarely venture in to the world of making their own homemade pimento cheese–after all–the stuff at the store is good. Why mess with what’s working? And I’ll be the first to admit I could feel the weight of every good southern grandma hanging on my shoulders as I worked with this recipe, but I think I’ve won out. I started out testing variations of others I found online and I came up with one glaring issue: cream cheese does not belong in homemade pimento cheese. The first version I tried (with cream cheese in it), my husband declared to be more of a dip and less of the proper pimento cheese. Good, but not for a sandwich–and I agreed. So with some more studying and trial and error, we’re there. A pimento is a canned type of bell pepper. That’s all. I should know because one summer when I was 15 my mom took out a contract with a pimento pepper factory and my brother and I picked what seemed like an endless supply of those things. Whole truckloads in fact that we broke our backs picking and then hauled them to a dump truck in some farmer’s driveway where they were transported to the factory for processing and canning. And no, I didn’t get paid. Mom was determined not to raise lazy bums for children. It worked, and I plan to torture my children in much the same way (while I work right alongside them because misery loves company). What does a pimento taste like? Get ready to be shocked: they taste like a mild bell pepper. They’re red so I think their flavor is already more mild than a green bell pepper. You’ll find them in the canned vegetable aisle of your grocery store in a small glass jar. You’ll need two 4-ounce jars for my recipe. If there’s nothing else I’ve learned, it’s that homemade pimento cheese doesn’t need a lot of fancy ingredients. After all, the lovely cooks who invented it were using what they had on hand–not making it complicated. We should take note. -Use any type of cheddar you like but I found that extra sharp was just too tangy. It overpowered the other flavors. Sharp cheddar was enough if you ask me. 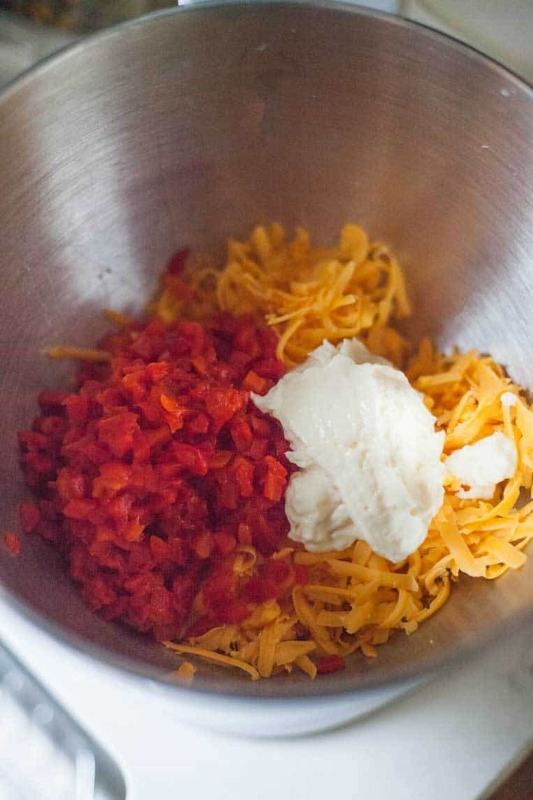 -Drain your pimentos well (press them) so your homemade pimento cheese doesn’t get too thin. Try to chop them finely before you add them so they can spread their flavor through the other ingredients well. -Use a good mayonnaise like Duke’s or Hellmann’s if you can get your hands on it. 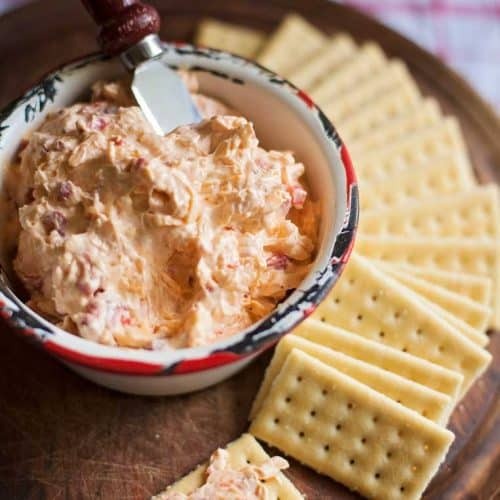 Homemade pimento cheese doesn't have to come out of a plastic tub from the grocery store. Learn how quick and simple it is to make! Put all the ingredients into the bowl of a stand mixer and beat on medium until the cheese softens up a bit and the pimentos mash in--about 3 minutes. You can also blend this mixture by hand with a mixer or stir it vigorously with a wooden spoon. I lost my fav recipe for pimiento cheese and it did Not have cream cheese. I believe this is it. I remember the dry mustard. Thank you! I was looking for a recipe for Thanksgiving, and all of them had cream cheese, which sounded wrong. I had palmetto cheese for the first time this summer, and it was SO good. But it did not have cream cheese, so it’s not going into mine!